aspirations the women identify for themselves. In Tamil Nadu, IFAD is supporting the Tamil Nadu Women Development Corporation in implementing the tsunami rehabilitation project in 13 coastal districts. In Thiruvallur, the project is being implemented in Pulicat in 85 habitations of Minjur Block. Pulicat lies approximately 40 km to the north of Chennai, on the seaward side of the barrier island of Sriharikote, which separates Pulicat lake from the Bay of Bengal (Pulicat lake is a shallow salt-water lagoon which stretches for about 60 km along the coast). The project collected data from 30 villages in 10 panchayats from this part of Minjur Block where the IFAD project is being implemented. 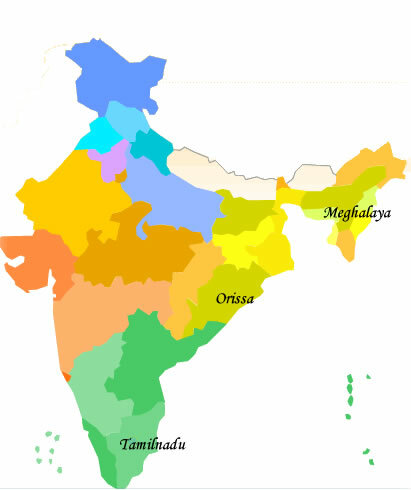 Gajapati district lies at the border of Andhra Pradesh and Orissa and has a mix of telugu and oriya speaking population. It is 50 km away from the nearest railhead (Palasa, Andhra Pradesh). Gumma is one of the tribal blocks in Gajapati and it has a hilly terrain and undulating topography. Inhabited by souras, (the second most prominent tribal community in Orissa), Gumma is at a distance of approximately 25 km from Paralakhemundi, the district headquarters. The project collected data from 45 villages from 19 panchayats. OTELP (Orissa Tribal Empowerment and Livelihoods Programme) funded by IFAD is being implemented in some of the selected panchayats in this block. In Meghalaya, Meghalaya Rural Development Society (MRDS), with the Government of Meghalaya, is implementing the IFAD-funded project “Livelihoods Improvement Project for the Himalayas." The MRDS is implementing the project in five districts of the state, including East Khasi Hills district. Mawphlang Block in East Khasi Hills district selected for this study is not far (25 km) from the state capital, Shillong. Though well connected by approach road, this block is quite rural. Agriculture is the main occupation of the khasis, who inhabit this region (Khasis are the dominant tribe of Meghalaya). Twenty four villages were selected for data collection for this study.